DBAL-I2 is rated 4.0 out of 5 by 19. Rated 5 out of 5 by LD1925 from Well built, very visible beams, compact. Just got my DBAL i2 yesterday, and already have it mounted and sighted. I purchased the green visible laser version. The visible laser is clear and very bright. The IR beam is also bright but does not produce an excess of bloom in NVDs. Great looking unit that seems very well made. Make sure to follow the directions when you sight it in! Battery compartment cap can be tricky to reinstall once you put the battery in...I find that one finger applying pressure on the cap and the other hand screwing it in works well. All in all very much worth the money. Rated 2 out of 5 by I Masters from Problems but hoping Steiner will make it right. I bought the model with both the illuminator and the IR laser aimer. Have shot it twice with PVS14. I love how it has the integral push button "fire" button and can be used without pesky pressure pads. However, mine has something wrong with it. After about 20 rounds it totally dies. Won't turn on or work until I remove the battery entirely and reinstall a battery. Not battery issue as it happens with any type of battery. Not shooting a heavy weapon either - just a suppressed 300 Blackout with less recoil than an AR. As of now, with my particular unit I cannot trust it with my life which is a shame because if it worked properly it would be everything I could ask for. HOPING STEIN MAKES IT RIGHT. Rated 3 out of 5 by Klem from Not bad Purchased an early release model. Excellent craftsmanship and kudos for the return to zero precision on the clamping mechanism. One glaring disadvantage is the mutually exclusive mechanisms for visible and IR. The IR laser cannot be zeroed during the daytime. The easiest method is to zero the visible laser during the day and then cowitness the two dots by using your NVD. Or, use an Aimpoint or EOTech to zero during the daytime and then cowitness the IR laser in the dark to the NV setting of the reflex sight. Another issue is the different adjustment mechanisms. Being able to adjust elevation and windage with the knurled knobs is great, but then having to carry and juggle a screwdriver to use the opposite slotted adjusters does not make sense. There are two IR settings on mine (HI and LOW). Both produce the same power output (<0.1mW). ).1mW is powerful enough with NVD's and in fact the military versions are often too bright and flare in the NVD. Like I said, well made, works, but has a couple of designer flaws. Rated 4 out of 5 by Howard from Review of DBAL I2 I am real happy with the overall experience with my purchase. I ordered through Optics planet(real quick shipping!) The green pointer laser stands out better and further than red(day or night). Nice solid clamp. I recommend if going with a red dot sight, get a 1/3 cowitness mount to optimize field of view on the optic. Picture shown is absolute cowitness Scalarworks, with Trijicon MRO, with DBAL I2 in the background. I wish the switch in the back had more distinct clicks for switching between off position, IR, and laser pointer. The clicks feel a little cheap, but the rest of the unit is built rock solid!! Real good price for this device. I own the red laser version(I2) and never had a problem with clamping or operating! Rated 1 out of 5 by MikeGilbert111 from No customer service I bought a DBAL (green/IR) and it simply stopped working. No drops, it wasn't damaged or struck by some object, it just stopped working. I called the support line, emailed, etc. and never received any feedback. Rated 5 out of 5 by Kevin1 from Everything you need & nothing you don't The combination of laser & Illuminator is about all you need for NVD shooting & hunting. The lack of visible laser doesn't hinder usefulness at all, & the benefits are that it can keep a lower profile than the likes of the DBAL-D2. Since the Illuminator is onboard, this could be run standalone on a night hunting rifle, provided that you didn't care to have a backup white light. Pros: Cost Simplicity Ruggedness Low profile & light weight Mount is QD Switch location Cons: Illuminator lacks very long throw The plug for remote switch isn't very secure with Surefire switches Mount does have some flex (point of impact changes) if you press too hard on the onboard button. Overall a great unit, good price for the features & reliability. Rated 5 out of 5 by yosha from WOW! I recently got night vision and needed to get a IR laser for my AR when my buddy told me about the DBAL-I2. He showed me his, and i was instantly hooked. I first used it at my property at 100 yards and wow it was crisp. Only took a couple minutes to sight in, and the illuminator lite up the target perfectly as well. The IR laser could be seen for 400+ yards but didn't shoot that far yet with it. I Love it and would recommend it to everyone. Rated 4 out of 5 by Tango Xray from Finally got one that works Awesome product but it took three tries to get one that functioned properly. 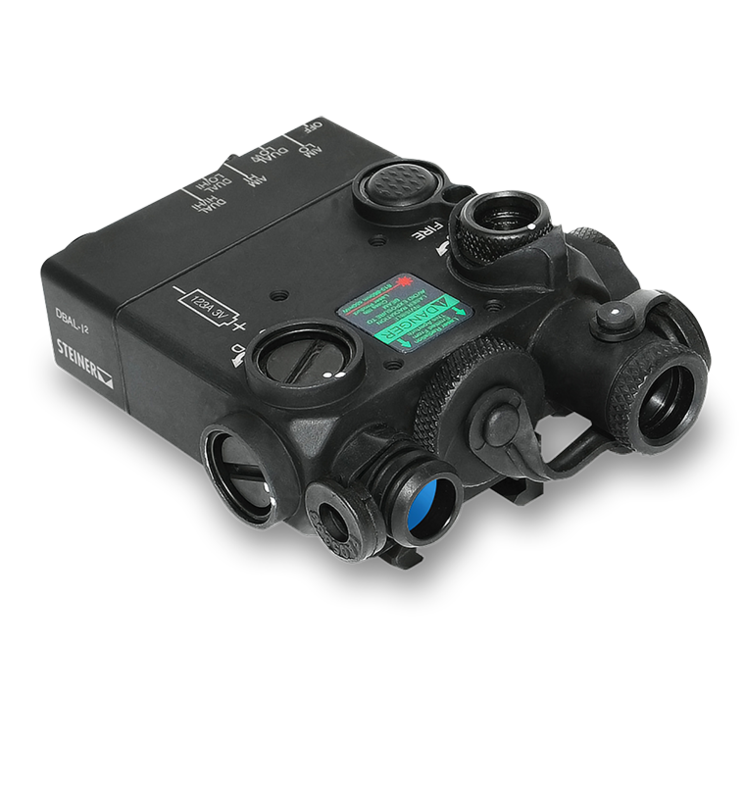 Item No # 9007 is a black unit has no visible laser, but just illuminator and IR pointer. Looks like Item # 9006 is the same unit, but in tan. Still no daylight laser and only has IR illuminator IR and pointer. Where can I find and buy Item No # 9006? #9006 is identical to #9003 aside from the color. The #9007 is unique in that it is IR-only, replacing the visible laser with an IR-Illuminator. All of these Item #'s can be ordered by our dealers and distributors, many of while have online outlets -opticsplanet.com is one of the major online retailers. hello , i have few questions to ask.Is the difference between DBAL-A3 AND DBAL-I2 thats the A3 its eye laser safe ? In simple words what dose IR illuminator mean in relation to the laser ? Dose it light up the laser pointer ? The biggest difference between the A3 and I2 is the co-aligned IR and visible aiming lasers. We have tested our products on a variety of calibers from 5.56 to 50 Caliber We are confident that our products will operate reliably on all military, law enforcement and commercially available firearms. I thought I saw a mount for a flashlight or an accessory that mounts to the Dbal to free up rail space. If so where can I find it? You are probably thinking of the DBAL-A4 which has a flashlight built into it. What are the combo connection options and differences between the DBAL-I2 and DBAL-A3 if I wanted to add a mk4 weapon light? I'm interested in the 9004 model. Does it have both, IR pointer AND IR illuminator? I have this unit. It arrived with a technical manual for the military version instead of the civilian version. How can I get the correct manual? Is this unit able to utilize AA batteries or is it only CR123? If it can take AA do you need a different battery cap and if so where do you get that? The DBAL-I2 can only accept CR123A batteries.